In planning today’s session, I thought the topic would be the flipped classroom, so I invited someone who’s presented on that topic before, Laine Marshall, to join us. 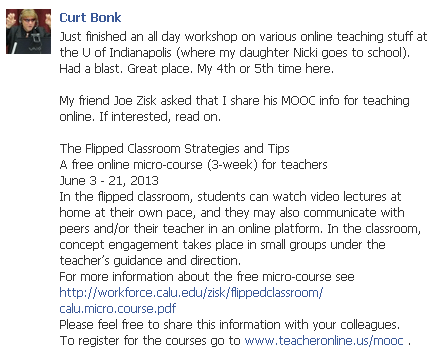 Laine is also a participant in LTMOOC. Meanwhile I’m pleased to find that I have been learning about Instreamia in flipped classroom mode, as is any participant in that MOOC engaged in learning from the tutorials. I thought it would also be interesting to discuss how we are learning on a spectrum ranging from purist cMOOC to robo-graded xMOOC, and this was touched on in the discussion. I also invited Maria Colussa to co-host. She has appeared with us previously in Learning2gether and Electronic Village Online. I’m not familiar with the ‘reblog’ process. I don’t know why someone would want to republish someone’s post on his blog without comment. There doesn’t seem to be any way to block or approve the process (I am notified, and the process leaves the above comment on my blog, if I approve that). But I visited the blog, only my two posts are there, and there is no profile given for Mr. Bartoli, but it states in his posts that they are reblogged from my blog here. Fair enough, but can anyone enlighten me on why someone would do this? Well, one reason could be that I arrived here through fbartoli’s post… We are both attending a MOOC for teachers about using technology at school, and this post of yours is very helpful. Thanks. Thanks Lucia, it’s really good to know that it’s teachers who are reblogging. In that case, you are welcome to do so – in fact if you’d like to join us at Learning2gether you could come on one Sunday or Monday and tell us more about your MOOC. We’d love to hear about it and make you a part of the Learning2gether experience 🙂 See http://learning2gether.pbworks.com/w/page/32205261/cfp for details. Happy to come and tell anyone interested about our great experience. I’ll keep in touch. Give me some time to understand whether there’s somebody else coming too. Wow! I feel very sorry about that, Vance. I admit I often reblog interesting posts i find on other wordpress blogs without commenting.. I hadn’t realized so far it could sound as a lack of netiquette as there is fair aknowledgment and the reblog needs to be moderated, I think.. It is just a (probably wrong) way of me of bookmarking and sharing with other teachers resources I think are worth sharing. i thought the ‘moderate’ option gave the author the chance not to approve and that was it. I must also admit, though, I quite like this wordpress peculiarity and use it quite often. I spend most of my connection hours sharing resources and I should probably pay more attention to the way I do it. I have to apologise too for the lack of personal info on my blog. I opened it just a few weeks ago as part of our mooc’s activities and there actually used to be a link for an “aboutme” page that apparently must have gone lost on one of the many changes of the blog’s lookandfeel. By the way, there are 74 posts on it (I’ have done my job, after all ) it’s just that when you click on the link to the blog from your comments area you land on a section where you can only see the posts related to the comment;; once there, you must enter the home page if you wish to see the other posts. I have been following learning2gether since my partecipation in your webinar for Baw 2013 and I think you are doing a great job. I have learned (and bookmarked!) a lot from you…. but it’s a good job I haven’t reblogged so many things… ! Gr8! See you 1400 GMT Sunday June 23, some time before that, at http://learningtimesevents.org/webheads/. You can go there and find the session moderator’s entry if you want to practice beforehand.